Technomad has written small software utilities for Windows, OS X, and (soon) Linux to automate connecting to the Schedulon. 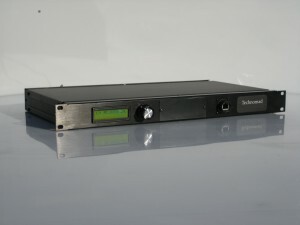 The software prompts you for the Schedulon’s IP addresss, then saves your current network settings and connects to the unit – and even opens your Web Browser with the Schedulon configuration page loaded. Then, when you’re done, you click the program’s “Disconnect” button and your original network settings are restored. This is the easiest and best way to connect to your Schedulon. Install and run the software to connect to your unit, following the simple instructions. Remember to connect your computer to the Schedulon with an Ethernet Cable. Use a CROSSOVER cable if you are connecting directly to the Schedulon from your computer (no hub or switch in the path). Use regular cables if you are connecting via a hub or switch. Connect your computer’s ethernet port directly to the Schedulon using a crossover cable (provided). Manually set your computer’s IP address to an address that is compatible with the IP address asssigned to the Schedulon. or any address like 192.168.1.3, 192.168.1.4, 192.168.1.5, etc. Once you’ve connected your computer to the Schedulon (and made the necessary network changes), you simply open a web browser (such as FireFox, Safari, Internet Explorer, etc), and type the IP address of the Schedulon into the address bar. So, so for default ‘from the factory’ Schedulons, you would type http://192.168.1.2 into the address bar of your brower, in the same place you might normally type http://www.economist.com. Doing this will load the Status page of the Schedulon. From here, you can navigate to the different tabbed pages of the Schedulon web interface, and make changes as desired. Note that the default password that protects certain pages is ‘0000’ (no username is required). YOU SHOULD CHANGE THE DEFAULT PASSWORD – it is not a secret! Once you are done configuring the Schedulon, restore your computer’s default network settings, disconnect the computer from the Schedulon, and reconnect to your normal network. It can be helpful to put the Schedulon onto your facility’s LAN. Once the unit is on your LAN, you will be able to connect to it via the network, without having to change your computer’s network settings. Discuss this with your IT staff. Note that the Schedulon can be assigned any fixed IP address you like (to join your network), and you can assign a default Gateway and subnet mask. This is done on the “Settings” page of the web interface, or via the LCM (making these changes directly via the Schedulon’s knob and screen). Note: you should write down your existing network setup information before changing your default setup. You’ll need this information when you want to restore your regular network connection. You may want to setup a special network ‘location’ for Schedulon management, different from the setup you use to connect to the internet and your LAN. These instructions assume you are connecting your computer directly to the Schedulon via a crossover cable – no hub or router between the devices. 3) Network Connections window will appear. Right click correct Local Area Connection and click Properties. 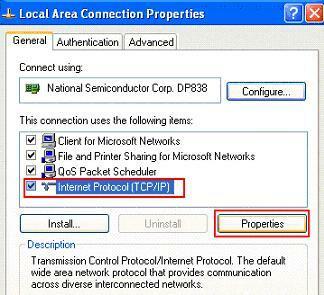 4) Select Internet Protocol (TCP/IP). Click on Properties. You can now type in the IP address (we suggest 192.168.1.200 for use with a default Schedulon). You can check what the IP address of the Schedulon is by powering it off, then on – the screen shows the IP address. IF THE UNIT IS SET TO A DIFFERENT ADDRESS THAN DEFAULT, just set your computer to an address that is the same, EXCEPT with a different last digit. 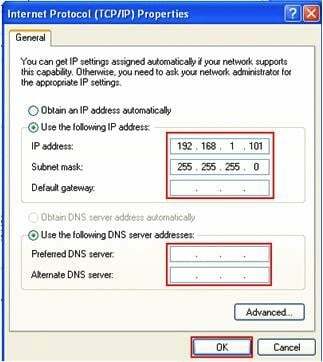 Leave the Default Gateway and DNS Server fields blank. Hit OK to apply the changes. Note: These instructions assume you are connecting your computer directly to the Schedulon via a crossover cable – no hub or router between the devices. 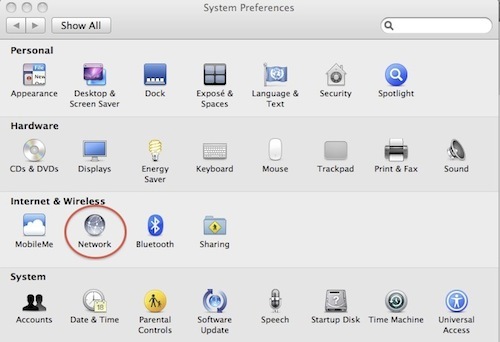 2) In the Network screen, take note of what your default “Location” is – you’ll want to know it’s name when you want to switch back to using your regular network connection. Now, click the Locations drop-down menu and choose Edit Locations from the bottom. 3) Click the + Symbol to ADD a new location – name this new location “Schedulon”, and click Done. 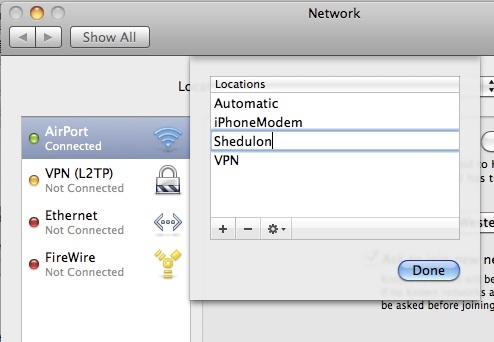 4) You will now see a screen where you can set the properties for the “Schedulon” network location. Set the IP address to 192.168.1.200 (assuming your Schedulon is set to the factory default IP address of 192.168.1.2). Hit Apply. You should now be able to start Safari or other web browser, and enter the IP address of the Schedulon into the address bar – the Status screen should display. WHEN YOU ARE DONE working with the Schedulon, disconnect the cable, and go to the Apple Menu (upper left corner of the screen, go to “Location”, and select the default Location you noted earlier. If you want to work with the Schedulon in the future, reconnect the crossover cable, and select the “Schedulon” location from the Apple menu – this is a fast, convenient way to connect. You only have to create the Schedulon location once! Directly connect your computer to the Schedulon via crossover Ethernet cable. Create a fixed IP address network setup, with subnet mask 255.255.255.0 and and IP address identical to that of the Schedulon (IP addresss is displayed on Schedulon screen upon power-up), but with different last octet. I.e. if default Schedulon IP is 192.168.1.1, we suggest setting your computer to IP address 192.168.1.200 or similar. Leave DNS and Gateway fields blank (unneeded).